Breakfast is the most commonly skipped meal of the day. Whether it’s a teenager running out the door to school or an adult on their way to work, mornings always seem rushed and breakfast is often pushed by the wayside. Wouldn’t it be great to have a hot breakfast from the microwave in just two minutes that you can eat with one hand? 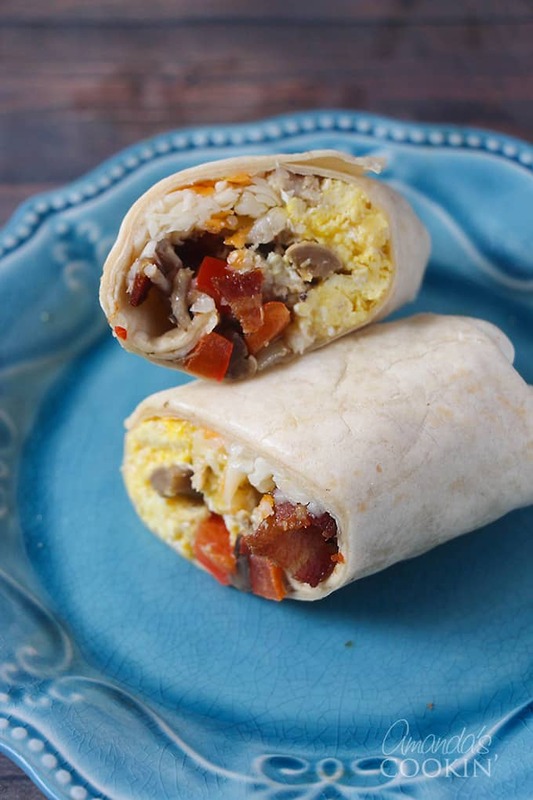 Make these freezer breakfast burritos ahead of time and enjoy them for days to come! I found this recipe in my friend Cheri’s book, The Complete Idiot’s Guide to Easy Freezer Meals . She was kind enough to send me a copy and I was eager to try something for breakfast first. Cheri and I have known each other since the late nineties and I’ve always known she was a whiz at freezing meals. When my kids were in high school they constantly ran out of the house with an empty stomach, which meant they had to wait until lunch to eat anything. 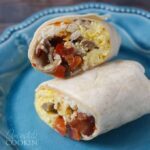 Having these freezer breakfast burritos was a great way to keep them fueled up until lunch time. Pop them in the microwave and off they went. A nice and simple breakfast for your fast paced environment. Cheri’s recipe includes green chiles and breakfast sausage. I changed the recipe a bit to fit our families tastes. Since not everyone here enjoys sausage, I made some with just bacon and some with a combination. I also love green peppers and mushrooms, so I added those in to the sausage burritos. I love these, they are delicious! Cheri’s recipe says it makes 16 breakfast burritos, but based off of the measurements for what to place in each burrito, I got 12, so I have changed the potato measurement below which should hopefully yield 16. Next time I think I’ll just do everything based on weight instead since there will always be fluctuations based off of individual ingredients and brands. If you’re looking for more freezer breakfast ideas check out my freezer french toast sticks or my freezer pancake dippers. 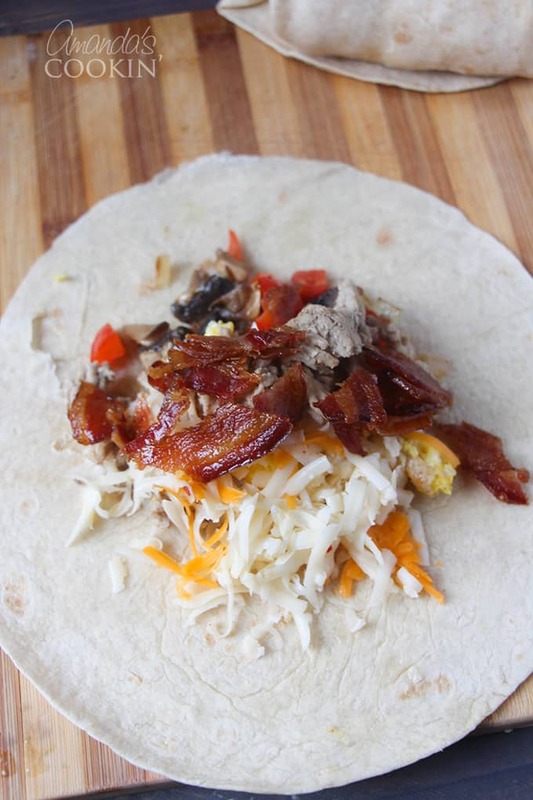 I make these breakfast burritos to freeze so we make sure we eat before running out the door. These are a great breakfast option for a fast paced life! Bring large pot of water to a boil over high heat. Add potatoes to boiling water, parboil for 8-10 minutes. Drain and set aside. Cook bacon for both types of burritos, drain and chop. Set aside in separate bowls. In large skillet over medium-high heat, heat 1 tablespoon of olive oil. Add potatoes and saute, stirring occasionally, about ten minutes, until potatoes are browned and almost cooked through. Season with salt and pepper, remove from pan and set aside. In same skillet over medium-high heat, heat remaining 2 teaspoons of olive oil. For Bacon and Egg Burritos, saute onion until softened and just beginning to brown. Add bacon to the onion and toss to coat. Remove and set aside. 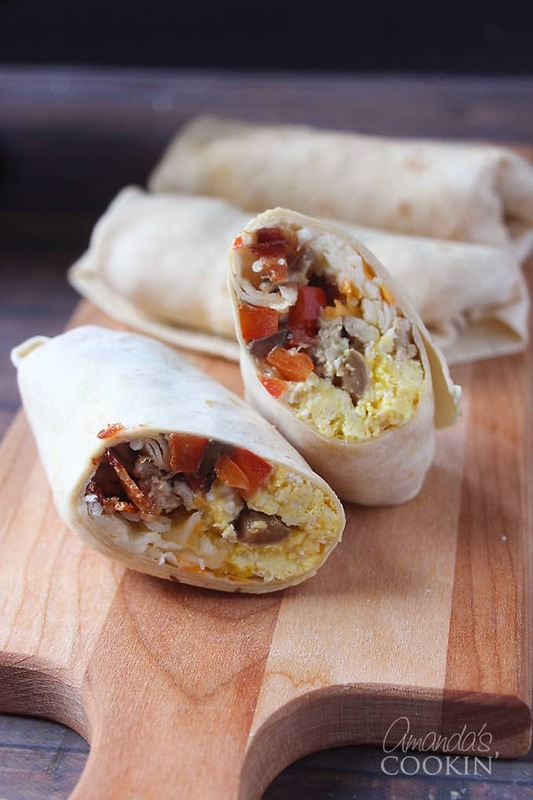 For Sausage, Bacon and Egg Burritos saute the green pepper, mushroom and onion mixture until softened and just beginning to brown. Add sausage and cook, crumbling as it cooks, about 6 minutes or until sausage is cooked through. Toss cooked bacon into mixture. Drain and set aside. Wipe any excess bacon or sausage grease from the skillet and heat a teaspoon of butter over medium heat. Add the eggs and cook, turning eggs frequently until eggs are set. Remove from heat. Center a tortilla on a 12-in piece of waxed paper. Place fillings down the center of each tortilla , leaving a 1/2" border at the top and bottom. For each tortilla use 1/4 cup cooked potatoes, 1/4 cup meat mixture, 1/4 cup egg and 2 tablespoons shredded cheese. Fold in top and bottom then roll up tortilla. 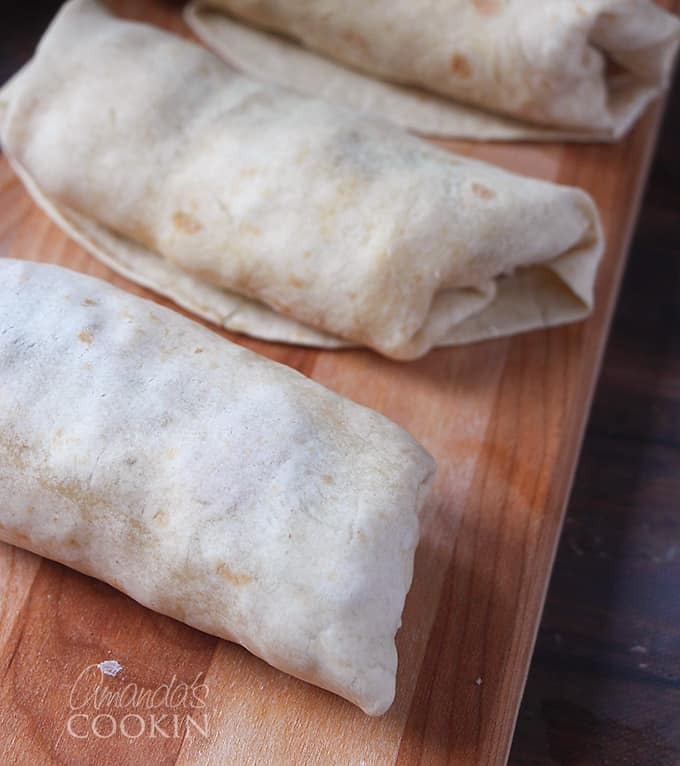 Wrap the filled tortilla tightly in the waxed paper and store wrapped burritos in a plastic zipper storage bag. Be sure to label and date the bag as well. Unwrap burrito from waxed paper, place on paper towel lined plate and microwave on high for 2 - 2 1/2 minutes. Stop and turn once during cooking. This post was originally published on this blog May 26, 2011. Hi there! 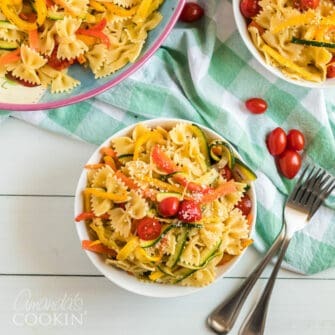 I LOVE your page and this recipe! I just had one quick question :) How do you think plastic wrap would do in place of the waxed paper? They could be wrapped tighter with plastic wrap then placed in freezer bag, but I wanted to ask before I possibly wasted a bunch of food and time if the plastic wrap didnt work! THanks! Hi Tiffany! Yes, plastic wrap would be fine for storing them. So glad this was helpful! This is inspired! I am going to have to give this a try–we have lots of eggs, and can always use a quick breakfast! Hi Bobbi. I would say two months. I used to make bean and chese burritoes for to freeze and take for lunch often. They were great, but I haven't really found a gluten-free tortilla that would stand up to the process. These days it's just rice bowls. Wrapping the waxed paper in foil too was my prefered method. It helped secure them a bit better, and helped hold it together while they defrosted in my lunch bag. Just make sure you take it off before microwaving!